Despite the fact that my youngest daughter wants nothing to do with fruit because of her extensive dental issues, she still loves playing with it in her pretend kitchen. As an effort to get her more comfortable with fruit and stop thinking of it as the enemy, I’ve created a series of fruit themed activities for preschoolers and kindergarteners to match our super cute fruit counters. 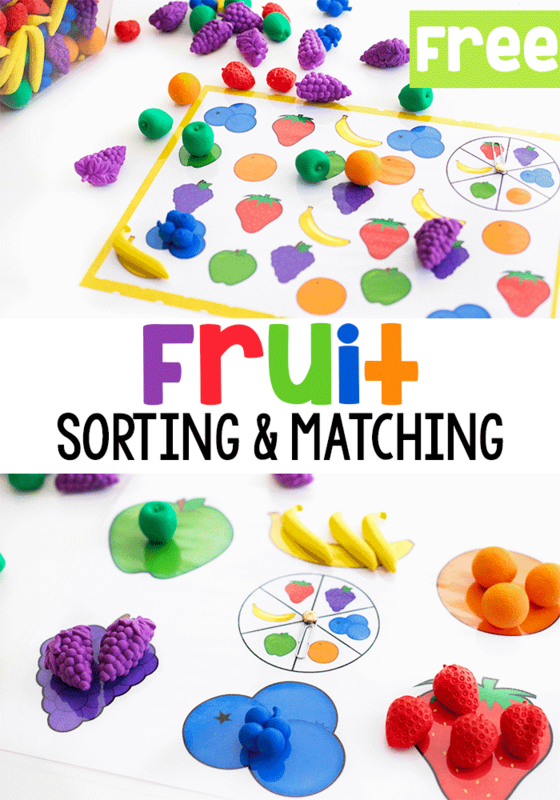 This free printable set of fruit themed games is great for building matching and sorting skills without it being a chore. 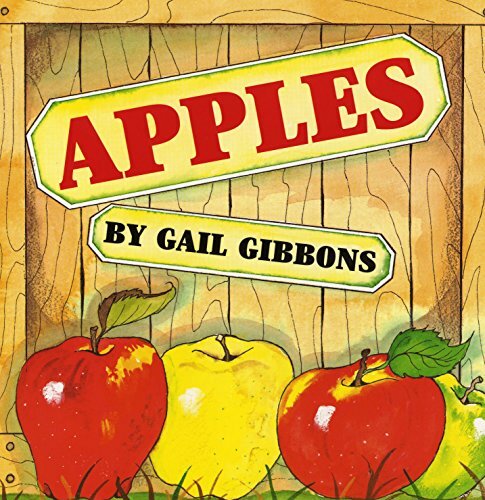 Kids love the interactive nature of these games and they make a great addition to any fruit theme or healthy eating theme. 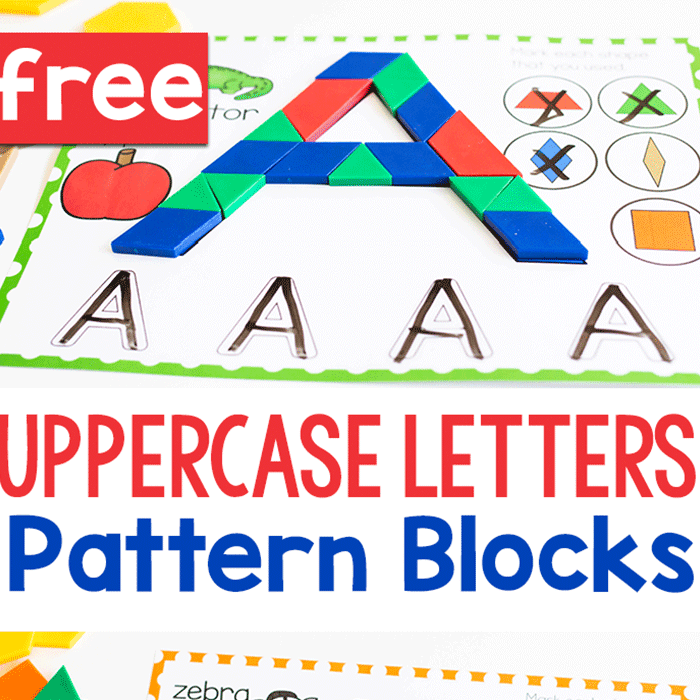 You can find even more free activities for preschool here. 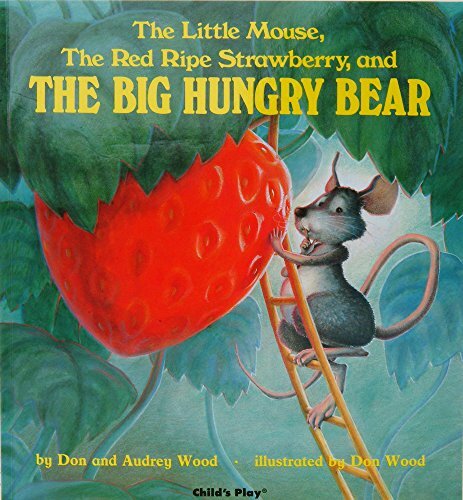 What to Do When Kids Won’t Try New Foods. We spent several months working with my daughter’s Occupational Therapist trying to expand her palette with very little success. Because Shiloh had so many dental issues as a toddler, which resulted in having almost all of her teeth pulled when she was 4 years old, she struggles with the textures of fruits. However, trying new foods is just not Shiloh’s thing. She just won’t do it, so with her OT’s recommendation we are saving traditional food therapy to try again later. Rather than engage in a battle of wills, we all decided that we wanted to keep food fun and not a source of a power play. We still offer new foods daily, but there is no pressure to try them. In the meantime, these fruit themed games are a great way to familiarize kids with common fruits, so we are using them with Shiloh to make fruits “fun”. 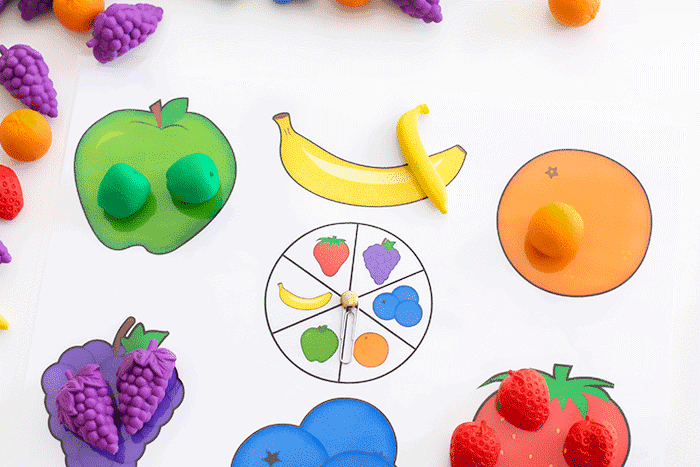 Preschoolers and kindergarteners love spinners and these fruit sorting and matching games are no exception. They love trying out their developing fine motor skills to push the paper clip spinner. And my daughter loves pushing it to the exact fruit that she wants instead of leaving it up to chance…aka cheating. Ha! Shiloh seems to think that every fruit needs to be covered equally, so she just cannot handle it if one of the fruit doesn’t get spun. She really just doesn’t understand games of chance…lol! There are several fruit counter options available and most have these five fruits included. 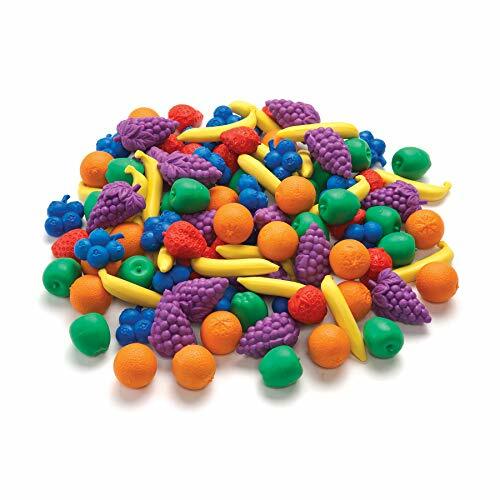 Our favorite and the one that we use all.the.time are these fruit counters from Learning Advantage. 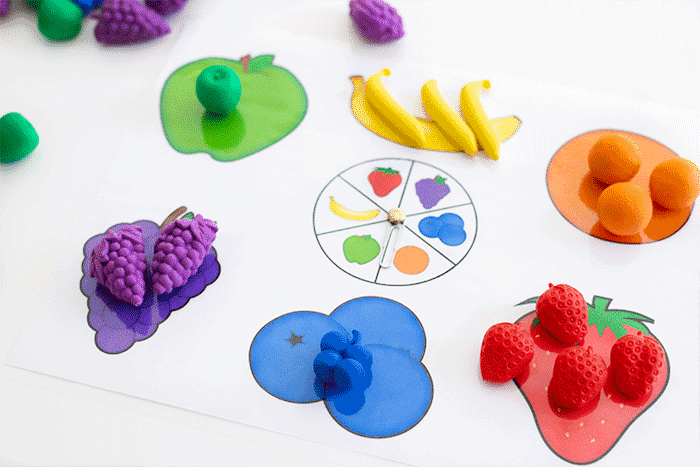 To prep the fruit games for preschool: Print and laminate the board games. Attach the spinner by poking the paper fastener through a paper clip and then through the center of the spinner. You can also create a temporary spinner by putting a paper clip on the point of a pencil and then holding the pencil on the spinner. I find it easiest for the kids if I create the spinner for them, but holding the pencil in place and spinning at the same time is a great way to engage more of the brain. It takes a lot of planning skills to figure out how to do both. So, if your kids are up for a challenge, give the pencil spinner method a try! 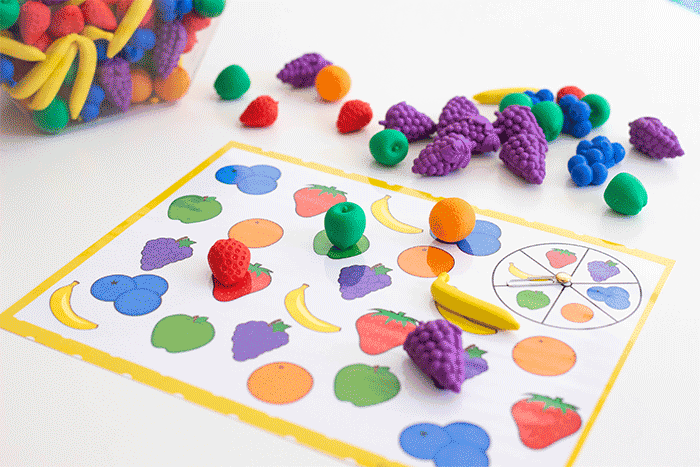 To play the fruit sorting and matching games: Spin the spinner and place a fruit manipulative onto the matching fruit on the game board. 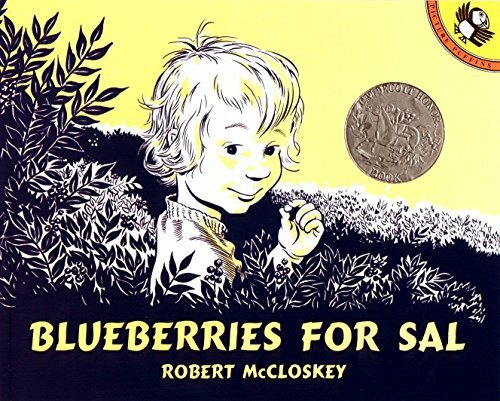 One game focuses on sorting by type of fruit: grapes, apple, blueberries, strawberry and banana. You can expand the sorting game by having the children name the color of the fruit that they have spun. Or you can have them count how many of each fruit they ended up with and identify which fruit has the most and which fruit has the least. 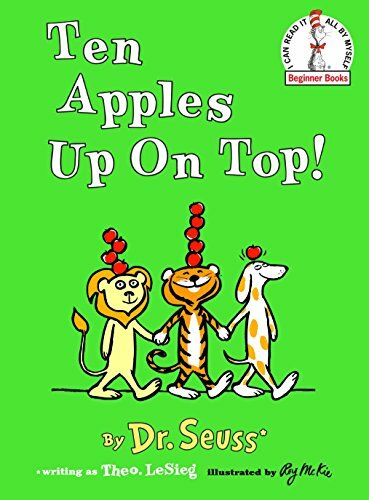 The second game is a matching game that helps kids with visual concentration and visual discrimination as they try to locate the correct fruit on the game board. This gives you two games to play with the kids that provide a simple way to engage them in a conversation about healthy food choices. 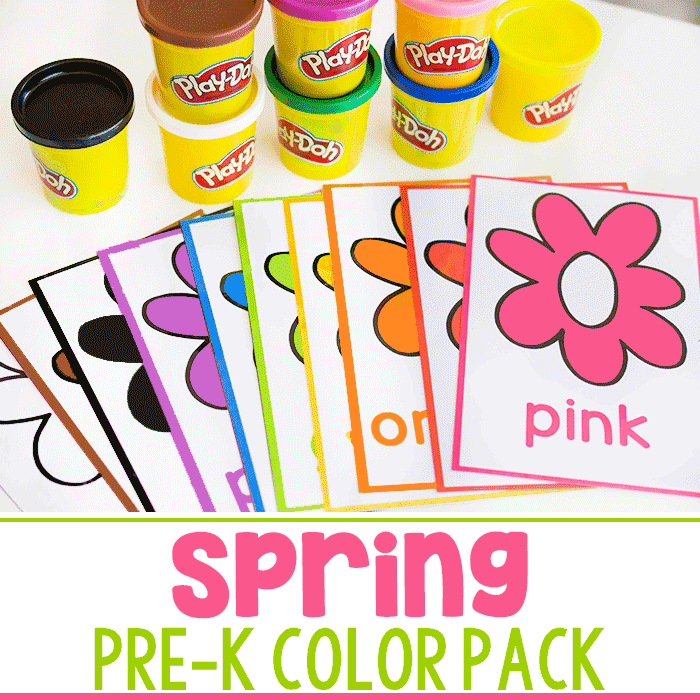 It’s also a great idea to play these games right before snack time and including some of these fruits in their snack. Sure, they might not eat them all, but research has shown us that kids need 8-15 exposures to new foods and for special needs kids, like my daughter, the number of exposures can be much higher. That doesn’t mean we should stop trying, though. 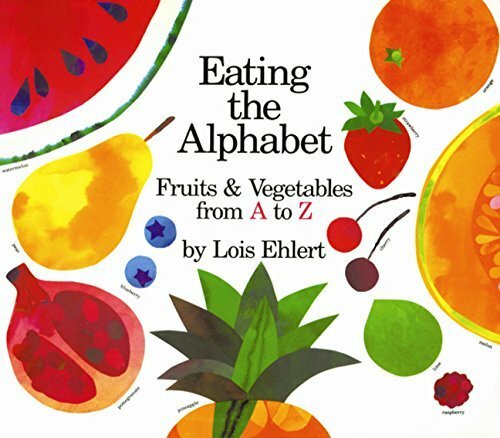 So grab your fruit games and a fun snack and have fun learning about fruits! 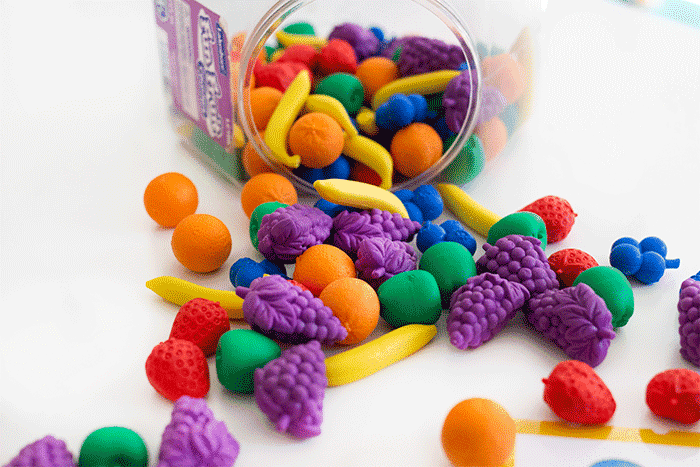 Pair it up with our super engaging fruit and vegetable sensory activity. 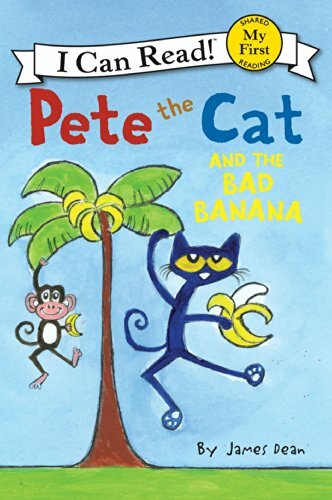 Extend the learning opportunity even further with some of our favorite books! 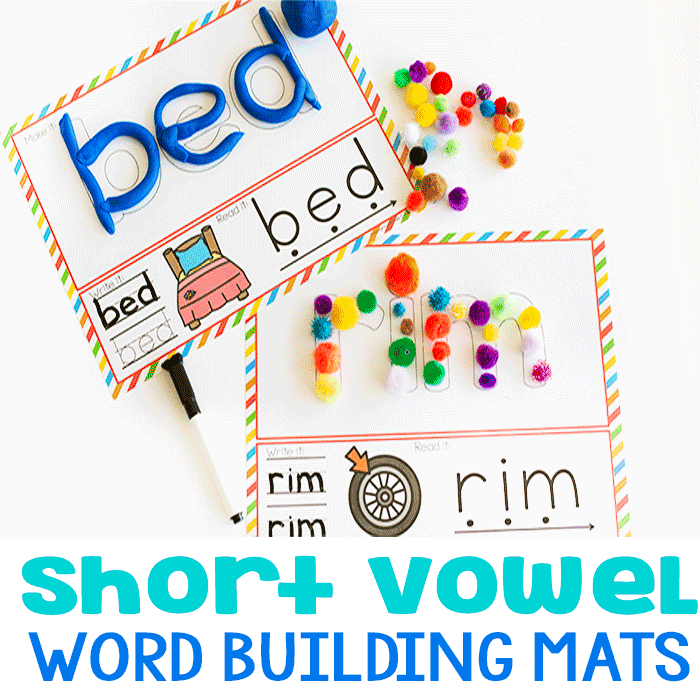 Thank you for sharing these printables.They are innovative and will prove to be of great value in my classroom.